From running your lawnmower once a month, to running numerous lawnmowers and an extensive range of landscaping equipment, extending the lifespan and getting the most out of your investment is important to all owners. Whether you are just starting out on lawn care equipment maintenance, or you are an old pro or landscape business owner looking for a way to better extend the lifespan of your investments, Amsoil Dealer - James Martin has some information below about how a synthetic oil change in Chambersburg can get the most out of your equipment. What Causes the Need for Part Replacement? From the moment you turn the key or pull the starter cord, each individual part inside your engine begins to work together and provide the combustion needed to keep your equipment running. As this happens, small shards of metal can break away from each of these parts. While this damage can seem incidental at first, as your engine continues to run this damage only gets worse, resulting in an eventual need to be replaced. To protect these parts and prevent them breaking down and requiring replacement, a comprehensive layer of protective film is needed to coat each part, acting as a barrier at they clash together. While conventional oils have the potential to provide a basic level of protection, when it comes to the constant running and high RPM operation of your lawnmower and landscaping equipment, a more enhanced level of protection is required. This protection comes in the form of a high quality synthetic oil. With a synthetic oil change in Chambersburg, your engine receives a product that has not only been scientifically refined, but includes purpose designed additives that enable it to provide superior protection throughout even the most intense of engine operations. To get this level of protection and prevent unnecessary damage and reduction to the lifespan of your lawnmower or landscaping equipment, speak with Amsoil Dealer - James Martin on (717) 776-4040 and let us find the perfect products for your needs. With so many satisfied customers, let us utilize our expert knowledge to help keep your equipment operating budget down. 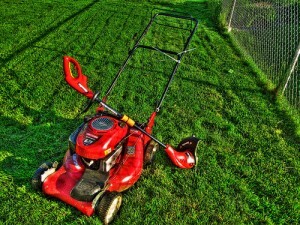 In addition to considering the upfront cost of any equipment, smart buyers also take into consideration the cost of operating each item, including how often it requires maintenance, what type of product is required to complete its maintenance, and how much down time will you or your gardeners have taking care of it. From purchasing one to an entire range of lawnmowers or landscape gardening equipment, it can be tempting to reach for the cheapest maintenance product available. When it comes to engines such as these, it's likely in the form of a conventional oil. Similar to the above mentioned benefit, the unique additives that are included in a high quality AMSOIL synthetic oil also have another benefit - resistance to evaporation. While conventional oils can easily break down and evaporate under regular and extreme operating conditions, the additives in synthetic oil work to maintain its consistency, and resist evaporation. It's no surprise that many owners immediately reach for the cheapest conventional oil available, however for smart owners who are looking to take care of their equipment and make sure they get as much use out of it as they can, the choice is a synthetic oil change in Chambersburg. While the initial cost may appear higher, the reduction in the frequency of a synthetic oil change in Chambersburg means less equipment downtime and less ongoing maintenance costs. Of course, when maintenance is required it isn't only your equipment that's out of action - it's likely you also. When considering the ongoing costs of engine maintenance, don't' forget the cost of your time taken away from your work, as this could result in a serious shift in your budget and engine oil requirements. With the availability of high quality synthetic oils, getting these and the many other benefits that come with synthetic oil change in Chambersburg is as easy as speaking with an expert and getting the right advice. Give us a call here at Amsoil Dealer - James Martin on (717) 776-4040 and let our experts utilize their knowledge to make sure you get the right product for you. If you have an idea about what you may want, head on over to our online store and check out our extensive range of high quality synthetic oil, not only for your lawnmower and landscaping equipment, but your car, motorcycle and even boat.